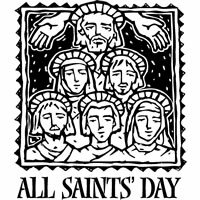 All Saints Day is a Principal Feast Day of the Church, taking precedence over any other day or observance. It is one of the four days recommended in the Book of Common Prayer (BCP) for Baptism. Traditionally, All Saints Day expresses the intercommunion of the living and the dead in the Body of Christ. Especially remembered are the faithful who died because of their faith. All Souls Day began as an extension of All Saints as a way to remember all the faithfully departed in a community based on the New Testament use of the word "saints" to describe all the people of the Christian community.